Another way cool image from one of the Danish beach racing events held at the Fanø beach. Spoke of this before in my post on Chr. Bohnstedt Pedersen the guy with an Militoir inline 4, if you remember (if not click on the Chr. B P name and you will be brought there to refresh your memory). 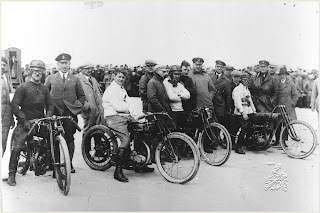 Picture from the 1923 Fanø races, from right to left; an Indian bigvalve Power Plus racer, a OHV FN, then a unbelivable beatiful Excelsior racer (that bike is for sure a story in itself)and finally a Harley racer with an interesting setup. The Harley engine is an early banjo case two cam engine, the frame is a factory keystone. Oh boy, wouldn we have loved to be at the scene?